from the Remixing the Hanford Declassified Project series of paintings. [column_one_half] [drop_cap style=”color:#ff6a28;”]T[/drop_cap]hat the plutonium dropped on Nagasaki was made at Hanford in southeastern Washington State, or that Hanford is said by some to be the most toxic site in the western hemisphere, and one of the most polluted sites in the world, is still, I don’t believe, known by many. One hears a lot about Los Alamos but not so much about Hanford, though leaking tanks have contaminated the groundwater and created a plume that will eventually reach the Columbia River if not contained. I grew up in Richland, a town that was built by the Manhattan Project to house workers at Hanford and which remains so proud of its heritage that the mascot of the Richland high school is a bomb, the students are known as The Bombers and the emblem of the school is a mushroom cloud. [column_one_half_last]My father was a scientist at Hanford through the 50s and 60s, studying the effects of low level radiation on miniature livestock and when I was nine years of age I was one of the many school children in Richland who took part in a very casually portrayed testing on the possible transmission of low level radiation through local dairy and food. So, though we moved away from Richland when I was ten years of age (to Augusta, Georgia, located next to the Savannah River Plant, which was another plutonium production facility and has its own troubled history) the area has been an abiding interest of mine, for Richland has a rather unique history and was an unusual place to live. In many ways it was a great place to grow up in, for the government and the town, even while poisoning the area, attempted to make Richland as attractive as possible to families, most of which were youthful with young children. I had approached some of the issues concerning Hanford in my book Unending Wonders of a Subatomic World or In Search of the Giant Penguin, but in the latter editing stages decided that this subplot was inessential and removed it. But I still wanted to do something concerning Hanford/Richland. When I learned of the Hanford Declassification Project which recently made available nearly 77,000 photographs and other documents, I was greatly interested. The Department of Energy, Richland Operations Office (RL) has aggressively implemented the commitments made by the Federal Government to openness in Government which was stated as a “Fundamental principle that an informed citizenry is essential to the democratic process and that the more the American people know about their Government, the better they will be governed. Openness in government is essential to accountability . . .” RL is committed to responsible openness. The Hanford Declassification Project (HDP) was initiated by RL to declassify to the maximum possible extent all previously classified Hanford operations information (documents and photographs). There are over 77,000 declassified photographs of early Hanford (1943 – 1960) available. These World War II and Cold War era photographs depict early Hanford construction and the employees/families who lived and built/operated the site. The archive first captured my imagination when a search for the words “Nagasaki” and “Hiroshima” yielded no results. It was curious to me that Nagasaki and Hiroshima had been excised so neatly from the declassified documents for this portion of the Manhattan Project, which made me wonder what I could find using keywords one wouldn’t associate with the bomb–such as dancers. Thus was initiated my own ongoing project of taking the photos and using them as base for digital paintings and collages, attempting to examine cultural context and–with the images and commentary–make a bridge between Hanford/Richland and Nagasaki, between the atomic era then and nearly three-quarters of a century on. 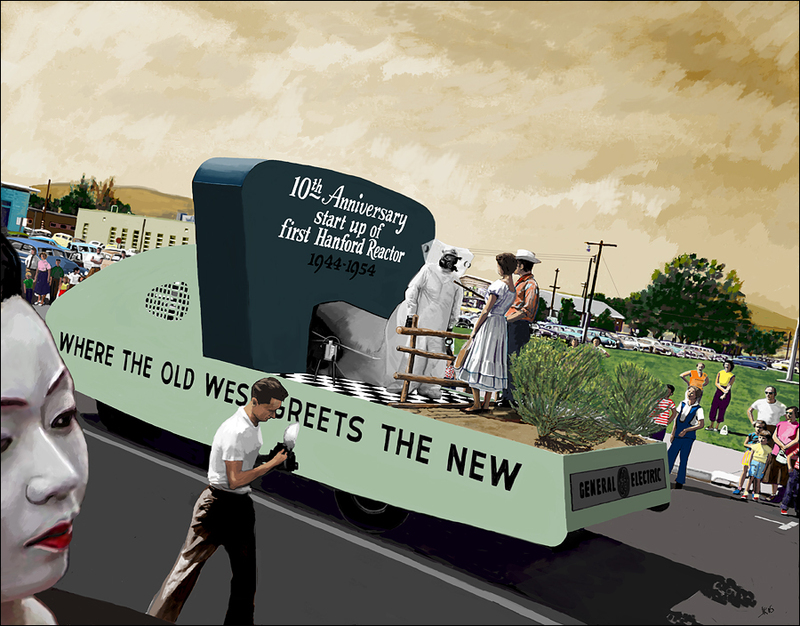 View all the paintings on my blog in the Remixing the Hanford Declassified Project category. Read my essay that initiated the project, Growing Up in the Shadow of Mount Fuji. I too grew up in Richland in the 50s/60s, summers swimming daily in the Columbia River, winters spent playing with atomic “trinkets” my dad brought home from his engineering job at Hanford. I remember vividly seeing all the white boxes on people’s porches, which I thought were for milk, when in fact they were used for urine specimens of Hanford workers. My mother had a breast cancer scare while we lived there, and more than one classmate’s parent died of cancer in those three years, too. Like you, we moved on to other downwind communities, and in my late 40s my thyroid took a nose dive. I’m now in my late 50s, and my thyroid continues to fail. My mother succumbed to breast cancer, and my died a few years ago at age 97, never sick a day of his life until Alzheimer’s took him down. My theory is the low-dose radiation to which he was exposed for decades killed diseases/ailments within rather than causing them, something I believe happens to a fortunate – and slim – segment of the population. 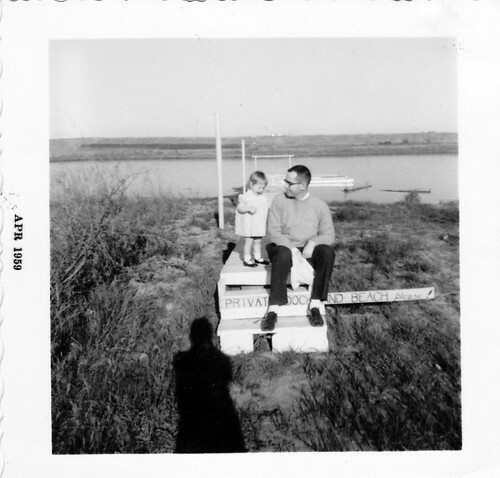 Like my dad, I am healthy as the proverbial horse, but a childhood of radiation swims killed off my thyroid. Only time will tell if other connections to that point in time are made, too. Ah well. Intercontinental Cry features Uranium, a 1990 National Film Board of Canada documentary about the sacrifice of indigenous peoples in the pursuit of nuclear power and profit.